The Musical environment in Detroit in 1974 was dominated by two major types of music - Rock as exemplified by Alice Cooper, Ted Nugent, Grand Funk Railroad & Bob Seger. On the other side, was R&B & Soul, from the incomparable Motown record label. Still a force, but no longer as completely dominant as they once were in the 1960s. So, if you were a budding musician, then these two options were pretty much the established genres of music that you should be looking to play and record, if you wanted a long term career. What though, if these two types of music weren't the types of sounds in your head, that you wanted to play to people? What if, you were cut from a different cloth? And had the upmost conviction that your new type of music had something else to offer? And, backed with this self belief, you also had the integrity to stay true to yourself - no matter what others may say about your brand of Rock 'N Roll? Siblings David, Dannis & Bobby Hackney had the love of music instilled in them from the earliest age they can recall, their parents always having music in the house, and when the opportunity arose, the chance was grabbed to purchase instruments that would set them on a path none could foresee at that point of time. The future was a very distant thing. After wreaking havoc on the local neighbourhood with their growing prowess on their chosen kit, it became apparent to all concerned that these boys had talent to burn. While attending a concert by The Who, eldest brother David had an epiphany: "That's the type of music WE SHOULD BE PLAYING!" Won over by his insistence, the other two quickly agreed that Rock music offered the right outlet for their growing social awareness about where society was at in 1974. David had only one requirement that he would stipulate strenuously, in fact, he decreed that it was non-negotiable term and condition if they were to pursue this new found direction. Their new band was going to be called DEATH. Nowadays, its very easy to visualize the impact this one detail would present at that time in history. 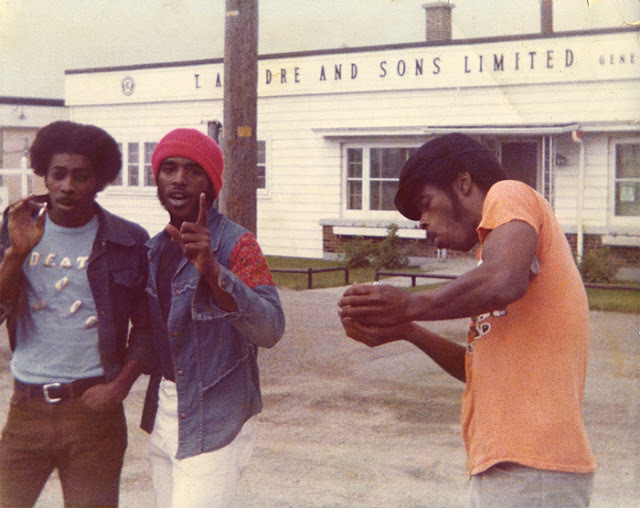 Back in 1974, three black brothers playing a 'fuzzed-up' raw, in-your-face sound that did not - in any shape or form - even remotely reassemble what else was happening in Detroit at that moment. It didn't even come close. And, they were called DEATH. Initially Dannis & Bobby did not think that this name was going to help them climb the ladder to stardom - and beyond. David though, was able to argue a very coherent logic as to the reasoning that made him determine this was the right name. The catalyst being the loss of their beloved father through a tragic traffic accident (Killed by a drunk driver whilst he was rushing an injured workmate to hospital). This travesty affected them all, none more so than David, who began questioning his place on this earth. Once he saw the light, that the name would be 'perfect' for them - and reflective of their current reality - he was never ever going to consider anything else. With a couple of weeks to reflect on this radical proposal, the younger two swung in behind David, lending him their full commitment to this venture into the unknown, to boldly go, where no band had gone before. Initially, they got great support from Ardent Recording Studio in Detroit, making the first demo tapes to start hawking around to radio stations and record companies. Most were impressed with this new aggressive sound, and might have been keen to give it the requisite promotional activity to make it well known, bar one minor detail. Yep, that name. Change it - and major success beckoned. It's only a name, right? Ah, no, that wasn't going to fly. At all. Not ever. Not as far as David was concerned. The name DEATH was an emphatic statement about these three talented musicians, and if David said no, they all said NO. Even though the other two knew that it would make a difference, but the core family value that their father imparted was this: Always look after your brothers. Always support them - no matter what. On the very brink of getting a major recording deal with the influential Clive Davis (Head supremo of Columbia Records), they had negotiated all terms bar one. The name change. The band wouldn't budge. Neither would the record company. With that door shut, many others soon began to shut as well. What seemed like a great vision of a powerful new type of music to spread to the world, soon faded to a tarnished reality that uncannily started to mimic the gradual decline that was seeping into daily life in Detroit. Beat, broken-down, battered, Death gigged as much as they could, but without a recording to let people take home, they eventually got to a point where they had to change. There wasn't many other avenues open to them at that stage. David, having created the complete concept, naturally took it the demise of the band the hardest. David being the true 'artiste', who having decided that DEATH was going to be his vehicle for delivering his message to the people, quickly made up his mind that it was DEATH - or nothing. In his mind, there wasn't a plan b. The plan was for DEATH to succeed. That was that. This heartfelt documentary provides another fascinating look into a band that should have been better known, but were fated to be cast on a different path than the one they assumed would lead them to rock 'n roll glory. Yes, this doco may seem cynical to some, that it's another resurrection story to revise an overlooked band from complete obscurity, but credit where credits due. Thank god then, they made this lovingly crafted movie that pays full tribute to pioneers who just weren't made for those times. These guys need to be heard!